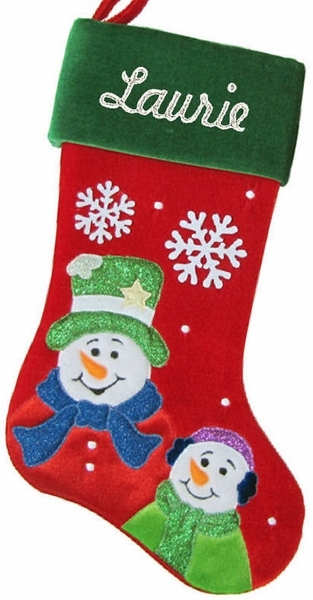 This Velvet stocking features a Papa snow man with his son out enjoying the newly dropped snow. Adorned with snowflakes on a velvet red body and a green cuff this stocking is the epitome of a holly jolly Christmas Stocking. Measured The stocking is plenty big, about 18" diagonally and 7 1/2" wide. Materials: The stocking is made of red and green velvet. Lining: YES. This stocking is lined inside with green polyester.